You’re going to want lots of snacks while you are camping. All the running and playing will have you and the kids burning a lot of energy which will also make you hungry. 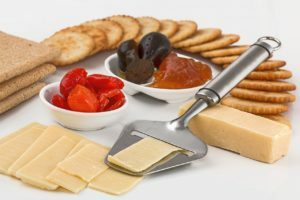 If you don’t want to spend a lot of time preparing food you can plan ahead for some easy finger food that everyone can grab and go when the hungries hit. Of course you can have lots of fresh veggies ready such as baby carrots and celery sticks. You may find that they are the last things left on the tray at the end of the day, however. If you put some peanut butter on the celery and have some cool ranch dip out for the carrot sticks they will go over much better. Make some three decker sandwiches, cut off the crusts, and slice them crosswise. You’ll have cute little three decker triangle sandwiches that are perfect for little hands or for just a nibble when you’re feeling snackish. If you have fruit set out cut it up into sections. Whole apples will rarely get touched but apple slices will go fast. You can submerge them in a bowl of water to keep them from browning and they’ll stay perfectly fresh. Roll some string cheese inside pieces of ham for a favorite with most people. They do need to stay cool so keep them in the fridge or cooler. The family can help themselves when they want one. There are a lot of individual snack bag treats that you might like to bring with you. Snacks such as Teddy Grahams or Ritz crackers with cheese make nice snacks that will stay fresh and dry no matter how long you are camping. We hope your time camping is spent having lots of fun and that you got some good snack ideas here. We look forward to seeing you this summer.